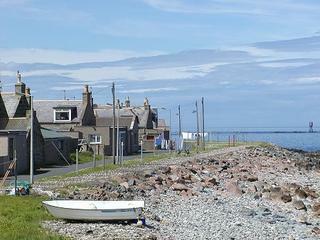 I leave early tomorrow morning to head home to Inverallochy for the weekend. Having left the small North East fishing village in my late teens, I've now lived longer in my adopted home, England than I lived in Scotland. I am glad that I made the move and have experienced things and expanded my horizons so much. But some how that tiny village will always be home. To be frank I don't think I could live there long term but there is always a little tug at the heart. Looking back it was such a great place to grow up. There seemed to be so much more freedom. There seemed to be a safety in the fact that you knew everyone and everyone knew you. Although very small and isolated there was so much adventure to be found be it playing down the rack, (Rocks by the sea) acting out war games in the countryside or following the sports seasons. Football in the winter was followed by Golf, Tennis and Cricket in the winter. Being Scotland even though our village was small it had a great golf course. We had no tennis courts but just made our own with a bit of white wash and fishing net. To be out with our friends was all that we wanted. It will be great to remember those days, seeing my Dad and spending some time with my young son will be a great way to spend the weekend. After all life is all about relationships its easy to forget that.